faces could work out well in the short term. FACT: Goligoski's first NHL goal came against the Ottawa Senators. Auld was in net. Wait a minute...are you a Pens fan...or a Nucks fan? davetherave wrote: Wait a minute...are you a Pens fan...or a Nucks fan? cause I have all their players in some pools and was born there. Did you know the Blackhawks have four players on their roster from the Vancouver area? 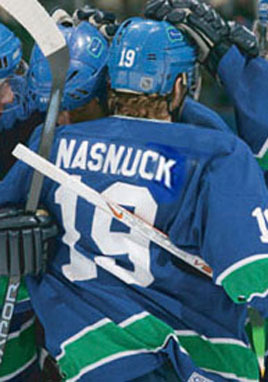 How many do the Nucks have? "Canada's Team"? They're the ones playing in Switzerland. Shabbs, my friend, you ARE a Man of Principles--I salute you! like that with Pro sports. It is not about a nation at all. to a Canadian City, American city, or Euro if it ever happens. I just want the cup in Pittsburgh again. Cheer for your Penguins...they came very close last year...and they might just get there again this year...so Cheer For YOUR Team. Wrong... I was refering to the Canucks!!! Willie Mitchell and Jason Labarbera. Hawks 4. Nucks= Entire province.